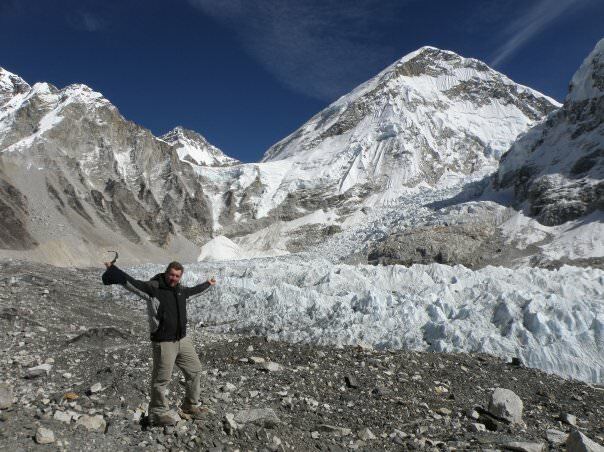 In my latest interview with personal friends and backpacking buddies I have met down the years, today I bring you Russell Sneddon from Sydney, Australia. Chained to my work desk in North Sydney. with my Long Service Leave (8 weeks) coming up in December 2015, I’m hoping to save another 4 before then and head back over to the Camino de Santiago, and wherever else I get the urge to go. Strangely, as I’m getting older I have the urge to go and visit those I’ve met along my way. Weirdest Job was an Online Sports Trader at tomwaterhouse.com. What was weird about it was that I loved EVERY minute of it. Antarctica was the craziest because it’s freaking ANTARCTICA. The other craziest place was the Djemma-El-Fna square in Marrakech. After a day of getting lost and constantly attempted to be ripped off in the Grand Bazaar , sitting with a couple of drinks in a bar overlooking the square watching it turn from day to night was crazy! Met him at Ushuaia the day before boarding our vessel to Antarctica when I boldly asked ‘what is an Englishman doing wearing a Parramatta football jersey’. I learned very quickly that Jonny was Northern Irish (just don’t try telling him an Irish joke). 10. Golden Rule of choosing where to sleep? For me, it’s the ‘10/80/10’ rule – When using social sites like TripAdvisor, ignore the best 10%, worst 10% of reviews for a place and based your decision on your gut and the middle 80% of reviews. There will always be people whose expectations were way too high, and there will always be people who think the hotel is the best place ever. But between all that you will find a wealth of useful information that will help you choose the perfect place. 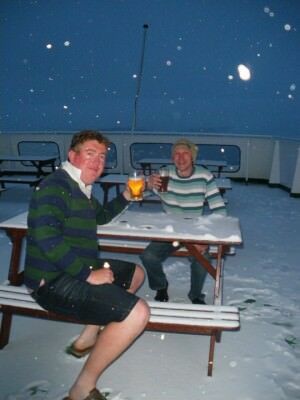 Backpacking Buddies – Russell and Jonny having a Beer on Deck in freezing Antarctica!